We really like the Nokia Lumia 720. It's a great all round smartphone and while it doesn't do enough for us to love it, we would seriously recommend it as an alternative to the Samsung Galaxy S3 mini and HTC One S.
Being the middle child is always difficult, so in that respect the Nokia Lumia 720 has it tough as it nestles slap bang in the centre of the Finnish firm's Windows Phone 8 range. Arriving on the scene alongside the budget-focussed Nokia Lumia 520 at MWC 2013, the Lumia 720 provides a happy middle point in a line up which also includes the Lumia 620, 820 and 920. 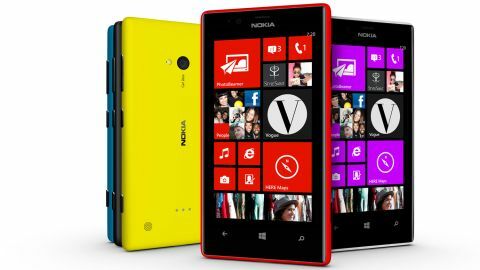 The Nokia Lumia 720 is available for around £300 ($460/AU$445) SIM-free, while on contract you'll be able to pick it up for free from £22 per month over two years. This pits the Lumia 720 against the likes of the HTC One SV, Samsung Galaxy S3 mini, Motorola Razr i and Sony Xperia T.
In terms of design the 720 apes the mobile monolith which is the Lumia 920 and the dinky 520, instead of the more rounded 820 and 620. It sports a distinctively plastic finish, however the unibody design means the Lumia 720 has a solid construction giving it a reassuring presence in the hand - although there's not much grip to be had. At 128g the Lumia 720 is a decent weight and it's a well balanced handset providing a relatively comfortable hold, although we would have liked the back to be a little more rounded so it hugged our palm better, but that's a minor blemish. We did find the red plastic was rather easy to mark and our Lumia 720 began to look grubby in next to no time - luckily though the surface wipes clean easily, which was a relief. Our Nokia Lumia 720 turned up in a fetching shade of red, but there is a choice of four other colours if that doesn't take your fancy with blue, yellow, black and white all up for grabs. While the colour extends from the rear to the sides of the device the front of the Lumia 720 is dominated by a slab of glass which covers the 4.3-inch display, 800 x 480 display. That's the same resolution as the Lumia 620, but with it's 3.8-inch display the 620 actually has a better pixel density (246ppi compared to 217ppi), resulting in the Lumia 720 screen lacking the sharpness and clarity of its smaller, cheaper brother. A great feature linked to the screen on the Lumia 720 is the ability to still use the phone while wearing a pair of gloves. This is slowly becoming more common in smartphones these days, but Nokia is really leading the way with this super sensitive screen technology. The standard Windows Phone menu keys lie in wait below the display, housed in a swath of black bezel while above the screen is a 1.3MP wide angle camera, allowing you to have video chats with your nearest and dearest. Down the right side you'll find the now common array of buttons which appear on all of Nokia's Lumia handsets these days - a volume rocker switch at the top, a power/lock key in the middle and a dedicated shutter button towards the base. All are easy to reach, although the camera key can be a little tricky if you're holding the Lumia 720 in your right hand. Up top you'll find the microSIM slot - which requires a little tool to pop out - and a headphone slot, while on the left the only thing to note is the inclusion of a microSD port with the same set up as the SIM, so don't lose the tool which opens these. What these ports tell us is that there's no way to get under the cover of the Lumia 720, meaning the 2,000mAh battery is locked away out of sight with no option to remove it.